What if there was a way for you to deliver a variety of content to a website user, based on where he or she is located geographically? Well, guess what: there is. This concept is known as geo-targeting. 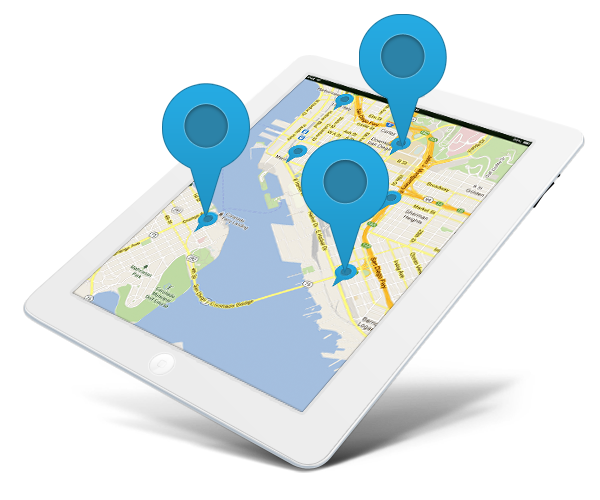 In this day and age, geo-targeting has really made a name for itself in the field of advertising, despite how relatively new this technological concept is. 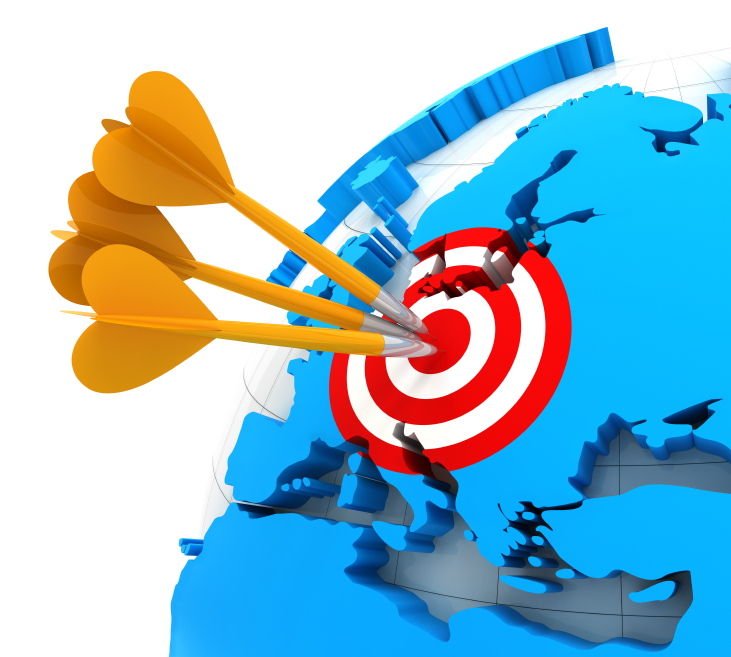 However, like many other technological breakthroughs, geo-targeting is still evolving. While it can be used on desktops at home to accommodate those running google searches from the comfort of their residences, the future of advertising lies in a very specific technique of geo-targeting: geo-targeting on mobile devices. According to a report by BIA/Kelsey, Location-targeted mobile ad revenues in the U.S. will grow from $6.8 billion in 2015, to a whopping $18.2 billion in 2019. There are a variety of implications associated with using geo-targeting as an advertising technique. One example, involves detecting where a user is located, and using certain types of currencies on an ad that appears in a certain vicinity, or on a company’s website. The biggest implication, however, is representing either a client base in a certain area of the world, or representing the country in which the company is based. For example, many companies like to show their prices either in US Dollars, or adjust the currency according to where the user is located. By adjusting the currency according to where the user is, it demonstrates a great deal of connection and willingness to unite with the client, whereas keeping the prices in the company’s local currency can prove to be okay, but it’s more limited. Kissmetrics is a great source for all things marketing-related. In their blog about geo-targeting, they state that A/B testing can be a great tool, as well as multivariate testing. Every detail can make all the difference- for example, on your website, will you show prices in USD or Euros to your audience in France? By making small manipulations, you can determine was will work best for your funnel. Half the time spent spent on digital media platforms takes place via mobile device usage. Consumers who are constantly connected, or always online, are checking their mobile devices upwards of 100 times a day. 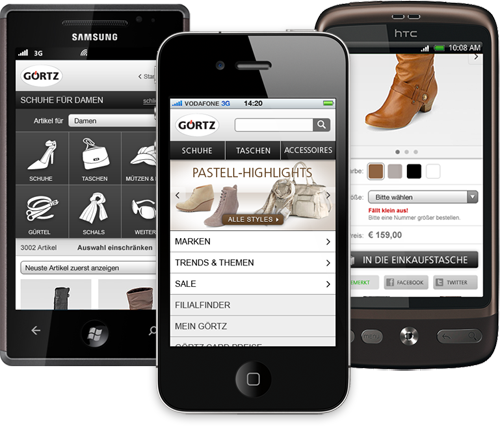 Consequently, advertisers have been establishing a focus on mobile advertising. Local search is heavily affected by mobile use. Data from Thrive Analytics carried out a study that suggested 60% of consumers use mobile devices to find information on local products and services, while the remaining 40% of consumers are on-the-go while searching. The Local Search Association, just launched LSA Insights, a tool that tracks local media performances, and can be used for planning for the local advertising and marketing community. This tool analyzes over 350,000 advertiser campaigns in a variety of media. 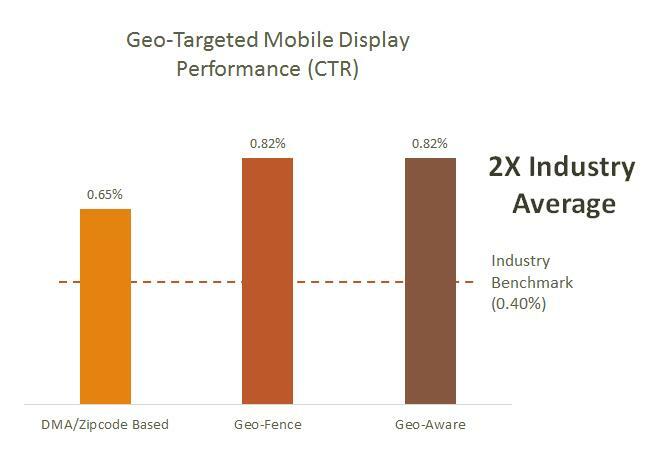 The LSA Insights statistics have shown that there is nearly a 7 times variance between verticals in effectiveness of driving secondary actions when using geo-targeted mobile display ads. 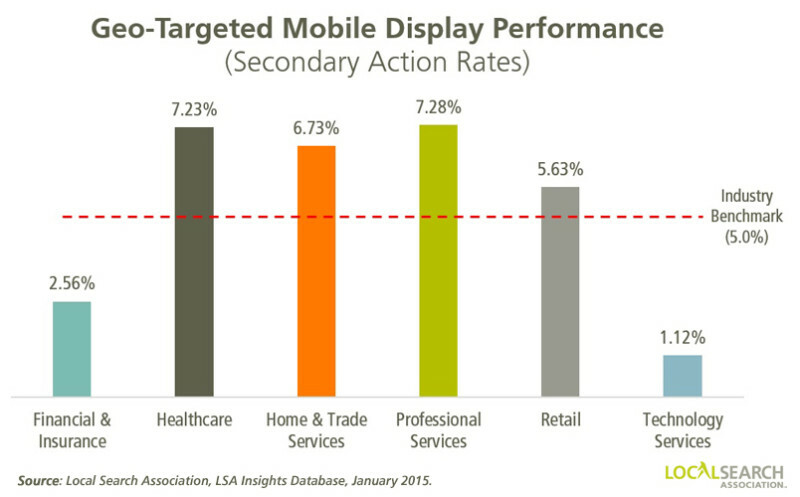 The following chart indicates that geo-targeted mobile ads are particularly effective at promoting secondary actions for healthcare, home & trade services, as well as professional services. Facebook is a prime example in how Geo-Targeting is evolving. Currently, it is testing a new feature called “Place Tips,” where the company will use signals from cellular networks, Wi-Fi, as and GPS to deliver local recommendations that are relevant to where the user is located. Many in the industry claim that the move may enable the platform to compete with other similar applications, like Yelp. Now, when iPhone users tap on “Place Tips”, located on the upper portion of their News Feed, they can see content from a business’ Facebook page along with what their friends have shared about that place. For example, popular menu items from a local restaurant. Users also have the option to opt out of this service if they so chose. For advertisers, this means a couple of things. One, is that they will have the ability to advertise via Facebook, which is an incredible technique for advertising, due to the fact that the ads will reach a variety and large pool of individuals. However, I think that the fact that people have the option of turning the “Place Tips” off, could hinder advertisers’ ultimate success in targeting the demographic that they would like to reach. Reduced Costs– Advertising can get rather costly. Instead of wasting money on the hopeful attempt to reel in conversion via standard advertising, publishers can now focus in on their audiences, and therefore save tremendous amounts of money, simply due to the lack of need to outsource to address the proper audience. Also, in terms of coupons and other redeemable items, vouchers that are sent online are more likely to be used. Speed- Geo-targeting is much faster to roll out than traditional advertising, such as television and radio because it is digital. Due to its nature, real-time feedback is available, unlike in traditional advertising channels. This makes geo-targeting much more flexible, and the age-old saying proves to be true: time is money. Also, because of the quick feedback, adjustments to campaigns that are ineffective can be made quickly, creating a more time-efficient workflow. Geographic targeting– This is benefit is probably the most obvious one, but is important nonetheless. Targeting by region or geography assists brands in engaging with different regional cultures (i.e. the west and east coasts of the United States). This in and of itself generates more sophisticated testing, and the more sophisticated a testing method is, the better results will be in the long run. For example, when testing a certain campaign in Asia vs the UK, it is crucial to run a few tests with native advertising in order to see what works best. Too Many Details– It’s pretty impossible to overgeneralize, especially when it comes to covering a mass group of people in a given area. How do you know that some of the population you’re targeting in a certain country aren’t foreign exchange students, or simply expats that will be in the said country indefinitely? Just because they may be located in Germany, does not mean that they are German, nor does it mean that you can assume their tastes and interests based on where they are located. Solution: Try to group as many possible categories in your demographic as possible, i.e. students, single parents, and expats. This way, you’ll have sub-targets that will account for a certain percentage of the overall group you are targeting. Gender– Another aspect of taste- what if a female is really into extreme sports, but based on the limited information you have on her, you deprive her of extreme sports-related advertisements, thus miss out on a potential opportunity to spike someone’s interest. Because you never know who you’re going to be targeting (on an individual level), it’s best not to assume. Solution: Try some multivariate or A/B testing with gender. Check if your product does better overall with men or women first (even if the answer might be obvious). There will always be anomalies in every trial, but at least this way, you’ll be able to check how significantly one gender responds to your campaign or product versus another. Language– This is probably the biggest disadvantage of geo-targeting. If you’re trying to target a population in India, then you’d better be ready to translate your campaigns into multiple languages, as there are so many spoken throughout the country. Outsourcing for translation can be time and money-consuming, and not just that- you never know who might be reading your content. Solution: Do proper research on the demographic you are targeting. For example, if you are targeting the city of Berlin, Germany, it would be in your best interest to include other languages into your campaigns as options, such as Turkish, English, Arabic, and Hebrew, seeing as Berlin largely consists of expats and immigrants from all over the world, especially the middle east. All in all, I think I made it pretty clear that assumptions aren’t particularly effective in geo-targeting, but I recommend giving it a try, nonetheless; regardless of how you choose to go about it. More and more ideas are stemming from various sources about the topic of geo-targeting, and techniques are sprouting up to no end. Check out this post to get some insight as to how the user experience is evolving, as having an idea regarding the evolution of the user experience can help you greatly in creating most optimal campaign for your audience.